Walking distance from Times Square, The Producers' Club is the Theater District's landmark Off Broadway playhouse in New York City. With five fully equipped theaters that convert into HD screening rooms, a Bar and Lounge, and two beautiful Studios, The Producers' Club is a conveniently located hub for artists of all disciplines to showcase their craft. We welcome you to improve troupes, repertoire theater companies, film makers, workshops, casting directors, performers, and artists of all kinds to call us home. At The Producers' Club, you'll not only have space in Midtown Manhattan for your creative projects, but a supportive community with an expansive industry network, experienced, knowledgeable staff, and competitive all inclusive rental rates with no hidden costs. Are you interested in booking a space...? Producers Club Theaters are open seven days a week, morning through late nights to accommodate both standard and late night productions. We will answer your phone, respond to emails, and be available to show you around and discuss your production in person. So stop on by The Producers' Club during our office hours for a tour, and to discuss how we can bring your vision to life. Need to rehearse a scene before class or a song before an unexpected performance? If we have space available, we've got you covered. Drop in, or call ahead, and your same day booking is only $20/hr. Are you an improve or sketch show? Do you have an idea for a show better suited to night life? Special includes two performance hours in any of our available theaters, use of the cash bar, and a majority of the regular performance amenities. 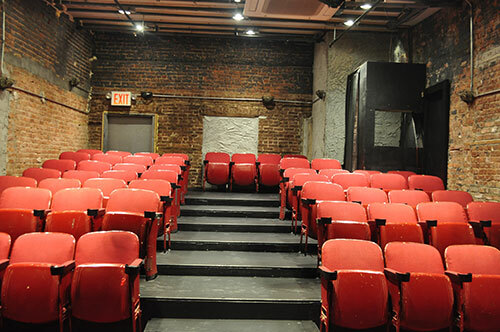 Specific theater space not guaranteed prior to rental date. Exact theater space determined an hour prior to reserved time. Theater may be specified earlier for an additional $25.